Ingredients: Chow Yun-Fat, Wen Jiang, Ge You, Xiaogang Feng, Kun Chen and Carina Lau. Directed by Wen Jiang. Run time: 132 minutes. Rated: Not rated. At First Bite: Chose this as my first Saturday film of ActionFest 2012. Seemed like it could be this year's THE GOOD, THE BAD, THE WEIRD. A group of bandits, led by Pocky Zhang (Jiang), ambushes a "train" carrying, Ma, the next governor of Goose Town (You), his wife (Lau) and his counselor. The counselor perishes, but, to avoid death, Ma poses as the counselor. Ma tells Pocky he can be the governor of Goose Town and split the taxes with Master Huang (Yun-Fat), the local mobster. Zhang would rather just take from Huang, not the townspeople. But, it's just not that easy. Tough to Swallow: In the opening, regular titles and subtitles conflict in telling the year. One reads 1919. The other reads 1920. Often, the subtitles go by pretty quickly. Not sure it had to be two hours and twelve minutes long. Something to Chew On: LET THE BULLETS FLY is China's highest-grossing film (domestic) of all-time, passing Xiaogang Feng's AFTERSHOCK. Feng plays the counselor in the opening scene of this movie. Jiang is also credited as one of the film's six screenwriters. The budget was an estimated $18 million. Aftertaste: LET THE BULLETS FLY was much funnier than I had expected. And, the laughs start right off the bat with the "train" robbery. Ge You is the comic relief, but Yun-Fat gets some chuckles because he plays two roles: the mobster and his double. For the most part, it plays like a black comedy -- since the death scenes are funny as well. I don't know enough about present-day China, but I've read how this movie is a commentary on the corruption they've seen. Maybe that's why it broke the box-office record there. Even though the movie runs long, its pace is pretty frenetic. The back-and-forth dialogue is tough to follow at times. If you don't like subtitles, this might be a tough film for you (unless the dubbed version stays true to the script). 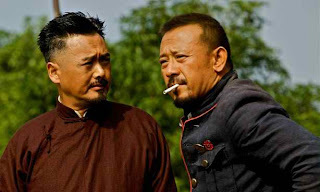 The game of one-upsmanship between Zhang and Huang grows and grows as the movie progresses. The laughs are entertaining, sure, but it's this battle that keeps you interested. They are great, well-written characters, and they're pretty badass, too. Comedy, violence and mind games: A winning trifecta. This is one of the first of the ActionFest 2012 flicks to get a DVD release (April 24, 2012), and I'm definitely planning on getting one. Ingredients: James Purefoy, Pete Postlethwaite, Jason Flemyng, Max von Sydow, Mackenzie Crook, Alice Krige, Rachel Hurd-Wood and Patrick Hurd-Wood. Directed by Michael J. Bassett. Run time: 104 minutes. Rated: Not rated. At First Bite: I had no expectations for the opening night film of ActionFest 2012. I knew nothing of the story. I only knew Purefoy and stunt coordinator Richard Ryan also teamed up for the first film presented at last year's ActionFest, IRONCLAD. 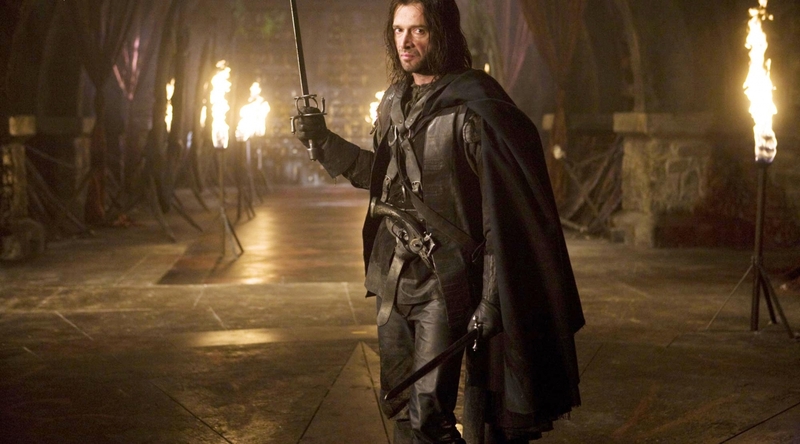 Solomon Kane (Purefoy) is an English mercenary/pirate who unfortunately meets up with the Devil's Reaper while helping himself to some treasure. Turns out Kane soul has been damned to Hell, and the Reaper wants to collect. Kane escapes and tries to denounce his barbaric ways, but a sorcerer named Malachi (Flemyng) has created an army to wreak havoc and draw Kane to him. Will he once more pick up his sword? Tough to Swallow: The flashbacks ruin the main twist. The Masked Rider's cape disappears after being set on fire. Something to Chew On: Robert E. Howard created the pulp magazine character of Solomon Kane in 1928. Conan the Barbarian is Howard's more well-known character. He's also known for Kull the Conqueror. Filming began in 2008, which was eleven years after the film rights were granted. Christopher Lambert (HIGHLANDER) was offered the lead in 2001. The movie was shot over 12 weeks time. The film's budget was $40 million. Purefoy suffered a head wound in a sword fight. The injury required five stitches. This film is intended to be the first of a trilogy. Aftertaste: I'll admit I was a bit disappointed to find out a 2009 film was opening a 2012 film festival, but it wasn't all that bad. Watching Purefoy is like watching Gerard Butler or Hugh Jackman, but maybe slightly more enjoyable. He actually reminded me more of Butler in IRONCLAD, and more of Jackman in SOLOMON KANE. Let's hope he doesn't start doing big budget rom-coms. His performance here is solid. He makes for a perfect anti-hero. Introducing the main villain at the end of the film is a mistake, in my opinion. And, the final battle is ho-hum. Overall, the fights are well-choreographed, but they are too sparse for a film like this. One of the final confrontations is ruined by all the flashbacks. The twist is sooooooo predictable. I love the look of the film. The cinematography and production design might be the best parts. Wait... the scene where Kane is crucified and works his way off the cross is actually my favorite part. Perhaps, with the origin story touched on with this entry, the following two films will be filled with more decapitations and shootouts.